A recent job involved mounting an (approximately) 80 year old quilt top, made by the grandmother of my client’s husband. It had somehow made it into an auction, was purchased by a woman who knew the family, and transferred back into family ownership. The husband remembers his grandmother as always having a quilt top in progress. The family owns several of her completed quilts. 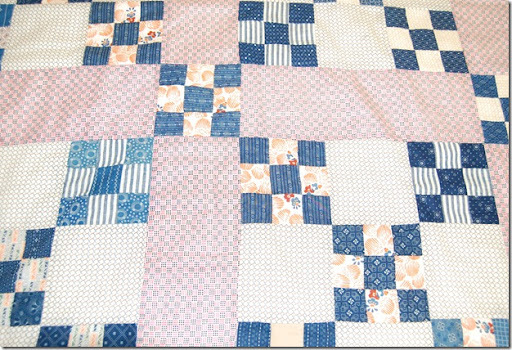 This quilt top is clearly made from a scrap basket, but there is a great deal of organization in the arrangement of individual patches and blocks. 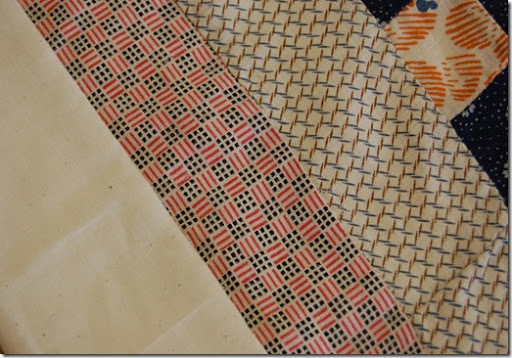 Once I laid the top out, I noticed the lines of blocks with the orange fabric running on a left-to-right diagonal. 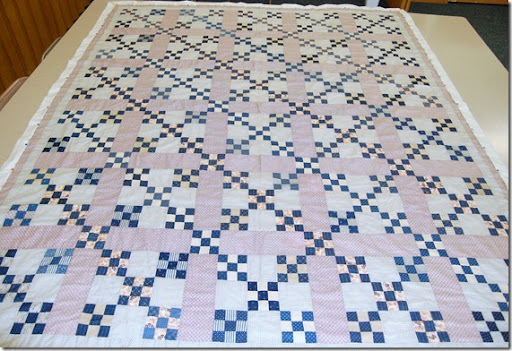 The fabric is too fragile to bear the stress of quilting, but the owner wanted to be able to give the top to her granddaughter as a quilt that could be laid on a bed or displayed over a rack. The solution was to mount the quilt, a method which creates less stress but gives the quilt a finished appearance and arrests the fraying that can occur as seam allowances rub against each other. If you have a vintage top that you’d like to finish for display purposes, you should consider a mount. It’s much faster than quilting and less risky for old textiles. Update: In response to Diana’s question in the comments, I’ve provided more detail on the stitch I used in making this mount in this post. Okay, I was with you until the part about making pick stitches through the seam allowances. I’m not sure what this means, and I can’t tell from the pictures. Can you explain this process further? I’ve run across some fragile tops and this sounds like a good way to be able to at least display them. So cool… I wouldn’t have known what to do at all!